Dawn Forlizzio with a white grunt added to her Saltwater Fish Life List. 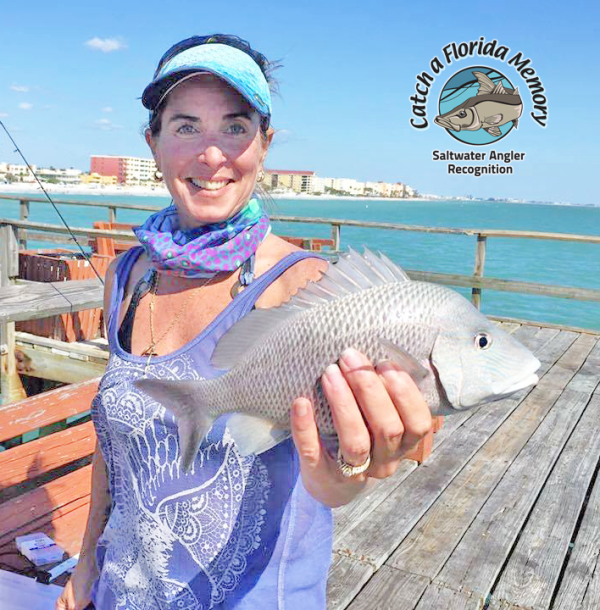 Beginning Jan. 1, 2019, anglers can submit white grunt, blueline tilefish, schoolmaster snapper and red porgy to the Florida Saltwater Fishing Records program. Beginning Jan. 1, 2019, anglers will have more opportunities to catch a Florida Saltwater Fishing Record. Four new species – white grunt, blueline tilefish, schoolmaster snapper and red porgy – will be added to the list of species eligible for a Florida Saltwater Fishing Record. Catches for these newly-added species must be made on or after Jan. 1, 2019, to qualify for a record. The Florida Fish and Wildlife Conservation Commission (FWC) maintains state records for the heaviest marine fishes caught in Florida state waters or in federal waters extending directly outward of Florida state waters in conventional tackle and fly-fishing categories. Saltwater record holders receive a certificate of accomplishment, prize pack, recognition in various publications and a custom ink fish print to memorialize their catch courtesy of Fish Print Shop. To qualify for a record, the catch must be weighed on a certified scale on land, and photographs must be submitted clearly showing the weight displayed on the scale, the rod and reel used to make the catch, the angler with their catch and various views of the fish for identification purposes. Species that are difficult to identify must be confirmed by a qualified fisheries biologist. The angler’s signature on a completedapplication form must be witnessed by a notary. For more information and to view current records, visit CatchaFloridaMemory.com and click on “Programs” and “Florida Saltwater Fishing Records”, or contact us atAnglerRecognition@MyFWC.com or 850-487-0554. Florida Saltwater Fishing Records are part of FWC’s Catch a Florida Memory – Saltwater Angler Recognition Programs. Anglers can gain recognition for catching record-sized fish and for participating in Saltwater Fish Life List, Saltwater Reel Big Fish and Saltwater Grand Slams. Programs reward anglers for their fishing efforts, while encouraging them to target a diversity of species. To learn more and submit catches, visit CatchaFloridaMemory.com.